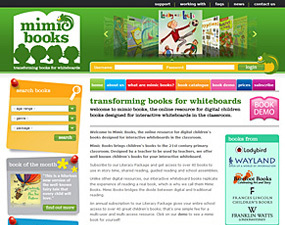 Mimic Books brief was to encapsulate the essence of their brand in a logo. A number of solutions were presented, from which Mimic selected their two favourites; a chameleon on a book and children sat in front of a interactive whiteboard. The two ideas were eventually brought together into one logo. A fun and descriptive logo that works well for the target audience and can work well with any medium. "Ichicoo Design designed our company website, logo, stationery and marketing material... we were so impressed with the quality of service, their attitude, value for money and their passion for their work..."